I wanted to show you one of my holiday outfits that I wore last Saturday to a Christmas party. Instead of a dress, I wanted to wear a skirt and top, because why not? Sometimes change is good! I am really in to the bell sleeves trend and how everything looks so much more grandiose and elegant when wearing it. So I decided on this bell sleeve top first, then I looked for the perfect skirt. 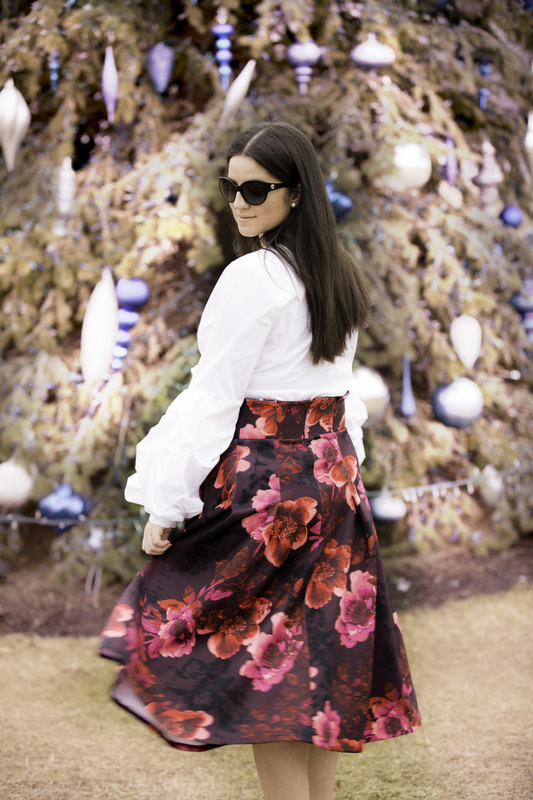 I knew I wanted some color to liven up the look so I paired the bell sleeve top with this beautiful red floral skirt. To complete the look I opted for gold bow pumps. BTW the skirt is currently on sale for under $30. Let me know what you think of this combination for a holiday outfit. Don’t forget to SHOP this look in the carousel below! I love your skirt Emily!!! Gorgeous! That skirt is gorgeous! I love how you styled everything. I hope you had a great Christmas! This skirt is ash-maze-ing!! you look awesome!